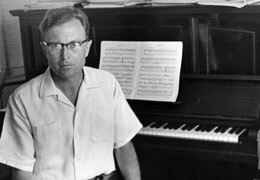 Kia ora and welcome to the official website of the late New Zealand composer Douglas Lilburn. Douglas died in 2001 leaving an extraordinary musical legacy. Performances of his music continue to happen all over the world, the The Alexander Turnbull Library Archive of New Zealand Music (which he helped establish) continues to preserve New Zealand's musical heritage and The Lilburn Trust continues to offer annual composition awards and generously fund music related projects. This website contains a rich collection of resources about Douglas including biographical notes, a timeline, composition details, images, audio and information about applying for grants and awards from the Lilburn Trust. The Trust regrets to inform that it will not be accepting grant applications for the round closing 31 October 2018.